* Avon Valley WL, Basingstoke Canal, Heathvale Bridge to Farnborough, Hants. Sun, 70.Alex Clements (Drennan Bordon) 19-3-0, and 18 lb 4 oz carp plus bits, poled worm; Mick Abbott (Shakespeare Hansfords) 5-12-0;John Brownlie (Browning Crowsports) 5-12-0;Paul Gibson (Arun Angling) 5-5-8;Rob Deacon (Drennan Bordon) 5-4-8;Alan Hillman (Shakespeare Hansfords) 3-11-0. Teams: Drennan Bordon, Arun Angling andTubertini Apollo all 45; Browning Crowsports 41. Final League: Drennan Bordon 16; Arun Angling 18;Shakespeare Hansfords 20; Browning Crowsports 21; Tubertini Apollo 22; Allans Marine 35; Bordon AC 38. * Bait-Tech Viaduct, Somerton, Somerset. Sun, 48, Silver Fish League, Campbell, Cary and Lodge. Steve Tucker (Garbolino) 21-10-0, one tench plus skimmers, maggot/caster, 14.5m, peg 110 Campbell; Bob Gullick (Garbolino BVMG) 20-13-0; Paul Greenwood (Bait Tech Viaduct) 17-4-0; Mash Masheder (Bait Tech Viaduct) 17-0-0; Andy Power (Preston Innovations Thatchers) 16-12-0; Ian Didcote (Bait-Tech) 16-10-0. Final League: Tony Rixon (Mosella Avon Angling) 5; Bob Gullick 6; Mark Brennan (Preston Innovations Thatchers) and Lee Werritt (Middy Bait-Tech) both 7. * Dynamite Oakfield/Alders WL, Pines and Ash Lakes, Oakfield, Bucks. Sun, 40. Tony Grigorjevs (Poles Apart) 119-15-0, carp to 6 lb, pellet, 14m, Pines peg 19; Matt Grant (Potter’s Wizards) 104-7-0; Myles Phillips (GOT Baits Red) 91-12-0; Wayne Shepperd (Ringer’s Green) 87-10-0; Josh Blavins (GOT Baits Red) 86-12-0; Phil Bardell (Allsorts) 84-3-0. Teams: GOT Baits Red 29; Middy 29; GOT Baits Black 26; Potter’s Wizards 26. League: GOT Baits Black 147; Potter’s Wizards 138; Chiltern MG 129. * Kent WL, Monk Lakes, Staplehurst, Kent. Sun, 50, Lakes 1/2/3. Robert Williams (Sensas South East) 104-6-0, all carp, pole and pellet; Mark Richardson (Sensas South East) 76-2-0; Paul Lamb (Sensas South East) 73-7-0; Lee Pollard (Maver Cardinals Red) 71-10-0; Graham Docker (Advanced Pole Repairs) 69-8-0; Jim Sene (Maver Cardinals Red) and Ian Germaney (Maver Cardinals Black) both 59-8-0. Teams: Sensas South East 41; Maver Cardinals Black 33; Advanced Pole Repairs 32; Maver Cardinals Red 27; Matt’s Tackle 12. Final League: Sensas South East 10; Maver Cardinals Black 10 (lower points countback); Advanced Pole Repairs 19; Maver Cardinals Red 26; Matt’s Tackle 26. * London WL, Grand Union Canal, Milton Keynes, Ducks. Sun, 50.Simon Colclough (Maver Image) 13-12-0, roach and perch, poled bloodworm and jokers; Andy Curless (Garbolino Black Horse) 8-10-0; Chris Vandervleit (Maver Image) 7-11-0; Mick Shepherd (Sensas Oakwood) 7-9-0; Bill Mariner (Sensas Oakwood) 6-12-0; John Davies (Sensas Oakwood) 6-2-0. Teams: Sensas Oakwood 38; Maver Image 36; Garbolino Black Horse 34. Final League: Sensas Oakwood 10; Maver Image 12; Garbolino Black Horse 14; Browning Northants 26; Team Raiders 28. * Ockendon Bait and Tackle, Puddledock Farm, Upminster, Essex. Sun, 40. Steve James (Ockendon Bait and Tackle) 230-4-0 carp to 9 lb, maggot just off bottom, 16m, Snake peg 11; Dave Jennings (Ockendon Bait and Tackle) 137-0-0; Alan Tuck (Angling Direct Suffolk) 65-12-0; Steve Mould (Ockendon Bait and Tackle) 63-10-0; Tony Smith (Ockendon Bait and Tackle) 47-4-0; Tony Todd (Ockendon Bait and Tackle) 45-5-0. Darren Wright (Sensas A4) 6-1-0. Teams: Drennan Banbury Gunsmiths 36; Sensas A4 31; Abingdon 30. Final League: Drennan Banbury Gunsmiths 15; Sensas A4 16; Isis 22. Individual winner: Mick Denton 37. * Rushmoor WL, Gold Valley, Ash, Hants. Sun, 70.Will Raison (Daiwa Dorking) 78-8-0, carp, big waggler & pellets; Dave Guntrip (Daiwa Dorking) 63-14-0; Robbie Taylor (Preston Innovations Delcac) 44-0-0; Jamie Maddox (KC Angling) 43-0-0; Ian Chatfield (Springlakes) 38-14-0; Ian Harper (Springlakes) 36-12-0. 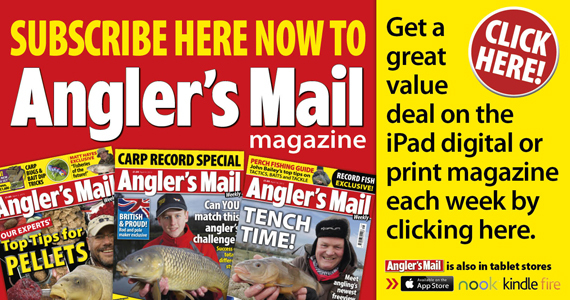 Teams: Daiwa Dorking 56; Preston Innovations Delcac 44; KC Angling 23. Final League: Daiwa Dorking 10; Preston Innovations Delcac 12; Farnborough 23; Gold Valley 23; Springlakes 28; KC Angling 30; Rushmoor 38. Individual: John Light 39. 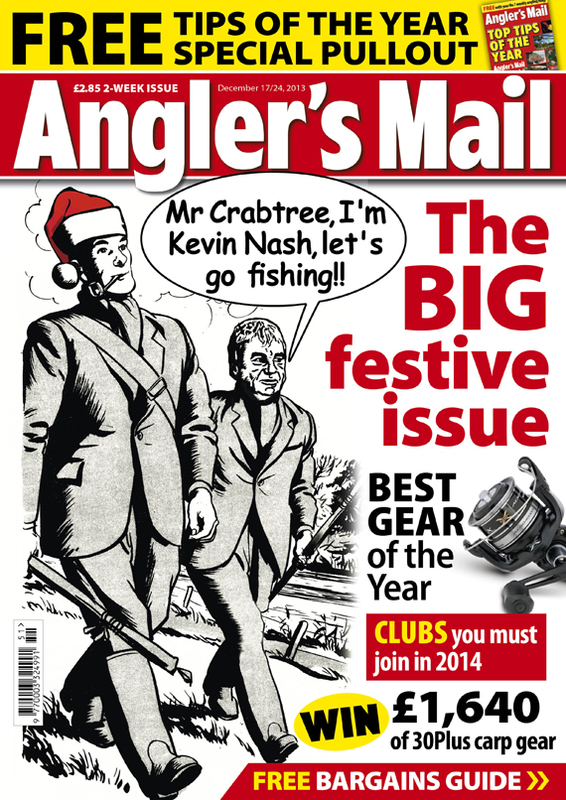 * Wiltshire Angling Xmas, Bristol Avon, Melksham and Barton Farm. Sun, 48. Stuart White (Premier Angling) 15-4-0, one skimmer plus roach, poled maggot over groundbait, Forest peg at Melksham; Liam Braddell (Preston Innovations Thatchers) 13-8-0; Sean O’Neill (Wiltshire Angling) 12-2-0; Mike Withy (Sensas Wiltshire Angling) 11-12-0; Rob Kepner (Devizes MG) 11-10-0; Mark Woolbridge (Premier Angling) 11-9-0. Avon Angling. Chilton Trinity, Somerset. Wed, 14. Kev Molten (Avon Angling) 71-7-0, carp to 9 lb, poled corn and maggot in margins, peg 15; Tony Rixon (Mosella Avon Angling) 62-10-0; Martin Lenaghan (Avon Angling) 34-1-0; Chris Fox (Sensas Thyers) 33-8-0; Matt Tomes (MFS) 28-3-0; Tim Pallent (Maver Veals) 22-7-0. Bathampton AA Over 55’s and Disabled, Hunstrete Bridge Pool, Somerset. Thurs, 28. Mike Nicholls (Silver Fox) 40-7-0, four carp and 5 lb of silvers, poled caster, peg 18; Bob Price (Bristol) 35-12-0; Terry Bruton (Thatchers Tackle) 35-10-0; Charlie Barnes 25-1-0; Paul Dicks (Bristol) 24-9-0; Dave Poole (Bath) 17-14-0. Silvers: John Smith (Bristol) 14-4-0. Colemans Cottage, Witham, Essex. Tues, 19. Jim Trew (Colemans Bait and Tackle) 94-0-0, carp, Wood Lake peg 38; Gavin Bridge (Cariers) 86-0-0; Pat Cooper (Cariers) 85-0-0; Trevor Hayden (Colemans Bait and Tackle) 74-0-0; Jim Barrowman (PW Angling) 66-0-0; Frank Thomas (Browning Wickford) 59-0-0. Essex Veterans, Oakford Farm, Chelmsford. Wed, 14, Middle Lake. Tony Cheeseman (Colmic) 32-8-0, carp, maggot to island, peg 7; Jim Hannington (Braintree) 16-4-0; Maurice Southall (Cariers) 16-0-0; Barry Bennett (Wass Tackle) and Ralph Larkin (Cariers) both 13-0-0. Gillingham AA Christmas Match. Dorset Stour, Deepwater, Highbridge and Stour Provost. Sun, 29. Adie West (Gillingham AA) 6-14-0, roach to stick and maggot plus two bream on feeder, peg 11 Highbridge; Rob Manns (Sensas Wiltshire Angling) 6-3-0; Mike Hunt (Gillingham AA) 5-3-0; Pat Smith (Gillingham AA) and John Moody (Garbolino BVMG) both 4-1-0; John Collings (Gillingham AA) and Malc Winters (Gillingham AA) both 4-0-0. Gwinear, Newquay, Cornwall. Sun, 10. Harry Billing (Garbolino) 35-2-0, carp, Method and pellet, peg 33; Andy Partridge (Spro) 30-12-0; Chris Hancock (Sensas/Gwinear) 30-4-0; Andy Patterson (White Acres) 27-4-0; Roger Baker (Sensas Thyers) 22-0-0. Ilminster AA Royal Oak WL, River Isle, Somerset. Sun, 6. Jamie Rich (Against Men and Fish/Burt Baits) 19-14-0, roach, dace and gudgeon, poled caster, peg 128 Isle Brewers; Bruce Hunt (Tiverton) 14-4-0; Rob Cox (Ilminster AA) 12-10-0. 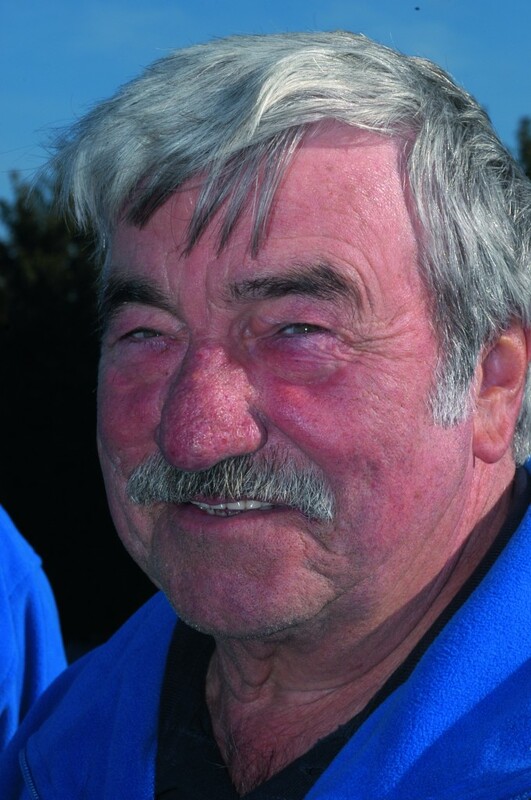 League: Jamie Rich 5; Bruce Hunt and Robin Cox both 7. Monk Lakes, Marden, Kent. Wed, 28, Lake 1. 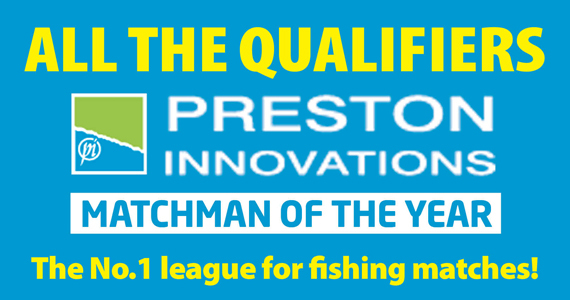 Derek Gladwin (Preston Innovations Delcac) 103-0-0, carp, long poled maggot, peg 40; Mark Allingham (Nick’s Tackle) 74-8-0; Brian Bathie (Medway Tackle) 33-0-0; Jim McDowell (Monks MG) 31-0-0; Fred Brown (Sensas SE) 28-0-0.More House Farm, nr Haywards Heath, E. Sussex. Sat, 13, Sidewinder Lake. Mark Standen (Haywards Heath) 25-12-0, pole and maggot, peg 44; Robert Harman (More House Farm) 22-0-0; Stuart Williamson (More House Farm) 19-6-0; Ray Warren (Leatherhead) 14-10-0. Sun, 12. Stuart Williamson (More House Farm) 67-2-0, all carp, pole and maggot, peg 20; Matt Hooper (Hassocks) 47-6-0; Robert Harman (More House Farm) 41-0-0. Royal Marines, Bait Tech Viaduct. Wed, 16, Silver fish, Spring Lake. Adam Palmer (Maver Royal Navy) 19-8-0, skimmers, long pole and caster, peg 16; Craig Tucker (Royal Marines) 18-11-0; Andy Baststone (Maver Royal Navy) 18-9-0; Stu Woods (Maver Royal Navy) 17-1-0. Sensas Commercial House Xmas, Kennet and Avon Canal, The George section. Sat, 21. John Harvey (Cardiff Nomads) 8-0-0, two skimmers plus roach, poled bread punch, peg 25; Liam Braddell (Preston Innovations Thatchers) 7-5-0; Sean Townsend (Maver Bathampton) 5-9-0; Mike Williams 5-8-0; Rich Lacey (Maver Bathampton) 5-7-0; Vince Lunn (Sensas Cardiff Nomads) 4-15-0. Shiplate Farm WL, Weston Super Mare, Somerset. Sun, 20, Hawthorn and Westpool. Russ Peck (Thatchers) 47-8-0, carp, poled maggot, peg 12 Westpool; Steve Howell (Shiplate) 42-0-0; Dean Malin (Shimano Dynamite Baits) 38-9-0; Andy France (Maver Cadbury Angling) 38-9-0; Jason Bird (Frys) 28-14-0; Alan Healey and Tom Light both 28-1-0. Tillingbourne Lakes, Gomshall, Surrey. Tues, 15.Brian Green (Willingshurst) 27-6-0, carp, poled corn; Nick Stunt (Apollo) 18-2-0; Alan Furlong (Weybridge) 12-2-0. Tylers Common, Brentwood, Essex. Sat, 22. Graham Dack (Middy) 167-8-0, 41 carp, maggot, 16m, Horseshoe peg 23; Paul Beck (Ockendon Bait and Tackle) 137-2-0; Eddy Feavor (Ockendon Bait and Tackle) 111-5-0; Mick Hood (Bowlers) 73-10-0; Gary Ford (Ockendon Bait and Tackle) 56-0-0; Geoff Forman (JP Tackle) 54-8-0. White Acres Silverfish League, Newquay, Cornwall. Wed, 15, Pollawyn and Jenny’s. Andy Dare (Garbolino Bolingey) 53-0-0, skimmers, roach and perch, poled caster and maggot, peg 25 Pollawyn; Harry Billing (Garbolino) 45-4-0; Mark Charnell (White Acres) 38-8-0; Andy Partridge (Spro) 34-10-0; Brian Loader (Gwinear) 21-8-0; Stewie Lister (Spro) 19-12-0. Willow Park, Ash, Hants. Wed, 17, over-50s. Rod Carroll (Farnham AS) 12-4-0, F1s and carp, poled maggots; Adrian Hoyle (Willow Park) 9-2-0; Eddy Rippon (Willow Park) 8-8-0. Sat, 8. Chris Love (Willow Park) 31-4-0, carp and skimmers, poled pellets. Wylands, Battle, East Sussex. Sun, 25, Old Snake Lake. John Oliver (Wylands) 65-0-0, all carp, maggot and corn to weed patch; Bill Postlethwaite (Matrix Invicta) 53-4-0; Keith Axell (Wylands) 50-8-0; Paul Lawton (Wylands) 47-4-0; Mark Mitchell (Cranbrook) 41-0-0; Tim Relf (Clive Vale) 34-4-0.